Universal-Automatic Compactor for Soil Testing - Universal-Automatic Compactor : ZI 3017-B ASTM D 558, BS 1377-4 It is a motor driven mechanical compactor useful for soil compaction into 100mm to 102 mm & 150mm to 152.4 mm diameter moulds. Two sets of Rammers are provided, one of 2.5 kg and arranged for 300 mm & 305 mm drop and other 4.5 kg and arranged for 450 mm & 457 mm drop. The rammer assembly is provided with a ratchet and pawl arrangement to lift it from the top of the soil layer. When the rammer reaches the required height the pawl release the rammer which falls freely on soil surface. The release mechanism is operated by an arm moving up and down which is connected to a reduction gear coupled to the motor through another arm. An automatic blow counter fitted to the compactor is used to set the number of blows. The base plate of the specimen mould is to be fitted to the rotating base plate of the instrument which marks 1/5” revolution per stroke. 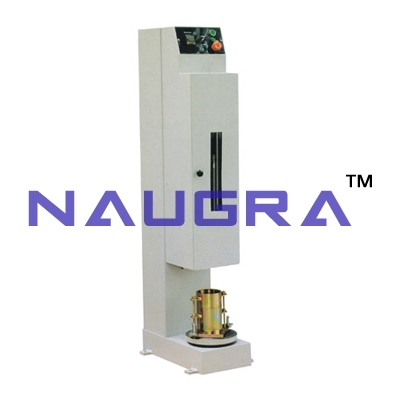 The equipment is suitable for operation on 230 V, 50 Cycles, Single Phase, A.C. supply moulds are to be ordered separately..
We are leading manufacturers, suppliers & exporters of Universal-Automatic Compactor For Testing Lab for Soil Testing Lab. Contact us to get high quality designed Universal-Automatic Compactor For Testing Lab for Soil Testing Lab for schools, colleges, universities, research labs, laboratories and various industries. We accept bulk orders for government tenders in all countries around the globe.